That’s according to a recent report from the CDC’s National Center for Health Statistics, which has tracked the rise of wireless-only households since 2003. 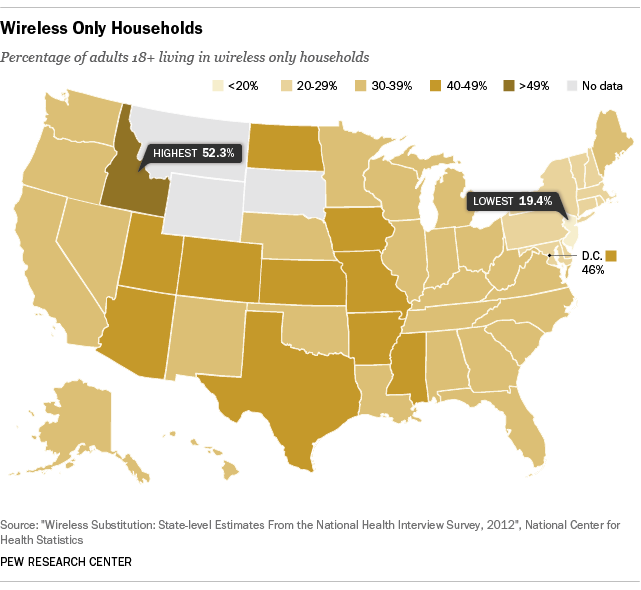 Close behind Idaho were Mississippi, where 49.4% of adults lived in wireless-only households, and Arkansas (49% of adults). Washington, D.C. came in fifth at 46%, just behind Utah, but New York was clustered near the bottom with several other Northeastern states, with 23.5% of adults in wireless-only households. Where you’re most likely to find a landline: New Jersey, where 78.9% of households have one (regardless of how much they use it). The patterns are similar when the analysis is expanded to include households that have a landline phone but receive most calls on cellphones. Largely rural states in the West and South have the highest shares of such “wireless-primary” households, while the lowest wireless-primary shares are clustered in the Northeast. Overall, according to a separate CDC report, two in every five American homes (39.4%) had only wireless phones as of the first half of 2013. About 38% of U.S. adults (or 90 million) and 45.4% of U.S. children (33 million) lived in wireless-only households. The wireless-only share has been rising steadily ever since the CDC began asking people about their phone status: Just three years ago only 26.6% of U.S. households were wireless-only. Young adults who grew up with cellphones may never have had a landline to give up, industry analysts say, while poor people may cut the cord on a seldom-used landline phone to save money. (As Bloomberg News notes, federal subsidies encourage low-cost and no-contract providers to give phones to low-income people.) As fewer people use traditional landlines, phone companies have become more reluctant to maintain their traditional switched networks; the resulting degradation of call quality, in turn, can lead even more people to switch. The CDC data are paralleled by Pew Research Center findings on people who use their phones to go online. A 2013 survey found, for example, that overall 34% of those “cell internet users” go online mostly using their phones, but the “cell-mostly” share rises to 45% among the lowest-income people, 50% among people ages 18 to 29, and 60% among Hispanics. The demographic and geographic differences between wireless-only and landline households pose a particular statistical challenge for survey researchers, who have to make sure that their samples of both groups are adequately represented and properly weighted in their analyses.